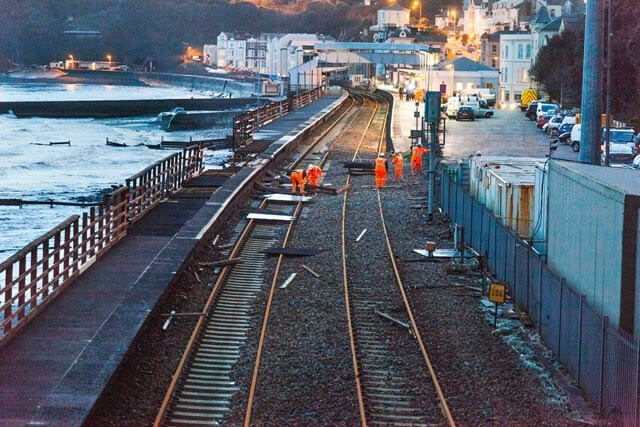 World leading engineers in coastal, tunnel, cliff and railway engineering are to carry out vital repair work in Dawlish, Devon, in November as Network Rail continues work to safeguard the stretch of railway that connects the south west with the rest of the country. Repairs will be made to four breakwaters, which are the barriers built out to sea to protect the coast from the force of waves, by expert engineering teams from Network Rail and BAM Nuttall with the vital work set to take six months. Protecting the route through Dawlish is a national priority and these immediate short-term improvements to the resilience of the railway will be made whilst Network Rail continues with the £15m detailed development of longer term options for government to consider. As a result, repairs to breakwaters at four locations along the coast will start next month after the structures were identified as being in a poor state of repair and not providing the protection that the coast and, therefore, this iconic stretch of railway line requires. The breakwaters that require repair are at Boat Cove, Coastguards Point, Colonnade Underpass and Langstone Rock. Along with the breakwater repairs by BAM Nuttall, Arcadis, another leading engineering company, will continue to investigate whether loose material from the top of the cliff above Parsons Tunnel at Holcombe may be removed to stabilise the cliff and therefore reduce the risk of land slips in the short-term. The South West Rail Resilience Programme has seen world-leading engineers conducting detailed studies along the route between Teignmouth and Dawlish which will determine what is happening to the cliffs and coastline, in order that the viability of a number of alternative solutions can be established. These options will help to secure the long-term future of this vital rail artery, which serves communities and businesses in South Devon and Cornwall, and connects the region to the rest of the UK. Mike Gallop, director of route asset management for Network Rail said: “This section of the railway is vital for many residents and communities in Devon and Cornwall and we are committed to safeguarding it for future generations. “However, it’s going to take us time to work out the best ways to protect the railway and then deliver these works, so we wanted to find ways now to make the railway more resilient than it currently is. By repairing the breakwaters we can give some immediate protection to the sea wall, the railway and town behind it, and we are looking at how we can put in place immediate, short term measures to reduce the risk of a landslip on the cliff at Holcombe. “Alongside this, we will continue to work up longer-term options for us to present to the local community, local councils and government in 2019. Cllr Humphrey Clemens, Teignbridge District Council’s portfolio holder for planning and coastal management, said: “Teignbridge has been working closely with Network Rail since the Dawlish 2014 event and remains keen to assist this regionally important infrastructure being made resilient for the future.